Choosing the right power washer in South Jersey can be challenging. 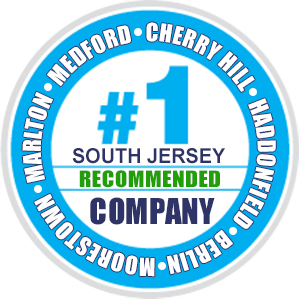 Our simple recommendation is that if you live in Marlton, Cherry Hill, Medford or Moorestown is that you first consider LOCAL companies. Does the company you’re considering live in our area? Are they miles and miles away, just ‘appearing’ to be local under the guise of their advertising? Please don’t fall for this. The very last headache you need is an out of town company who will not be there when it’s critical and you need them. Ask them & challenge this always. See if they can see your property TODAY. Chances are they won’t be able to. Why? Because they aren’t local. What happens when you need follow-up on a completed project? Don’t settle for a company that will reschedule you to accommodate their long trip to our community. Demand local. 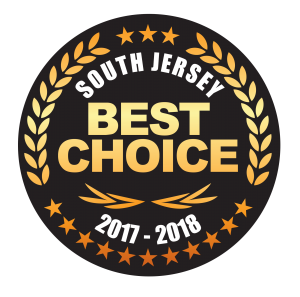 We’ve been doing this for over a decade in Marlton, and our 600+ certified reviews will show you why we’re the FIRST CHOICE in Power Washing and Roof Cleaning. Online Reviews – This is an often overlooked or minimalized factor. However this is the best way to gauge community feedback. Does the company have only a handful (<250) of reviews? Ask them why. If they have been in business for only a handful of years, they will have but a handful of reviews. This is a big warning sign or red flag. Companies with 500+ reviews have obviously been in business a much longer time and the community is most comfortable with them. Pick a company the local community picks, you’ll be safe for sure. Experience – Nothing beats a company’s reputation. You can again check online and ask the local community. Fly-by-night companies who live miles away can be quickly spotted. Always look for the local experienced power washer, and ask them where they’re from. Chances are you’ll be shocked who you’re dealing with. Guarantees/Warranties – We are often imitated by out of town companies looking to ‘piggy-back’ on our history of success. In addition to reviews, ask for their warranty and customer service policies. You won’t regret knowing this information in advance. It very well will save you (and your home) in the end. Go with the company who created the original warranties, not some copycat company that produces look-alike claims. Watch out for this one! In choosing the right power washer for your next project, we mentioned guarantees are important. What if something goes wrong? What assurances do you have that the company stands behind their work? Homes in Marlton, Cherry Hill, Medford or Moorestown are South Jersey’s finest. Pick a power washing and roof cleaning company who is devoted to customer service. You can again get a sense of this online, in reviews and comments. However, you can gain insight by asking for their guarantees and warranties. 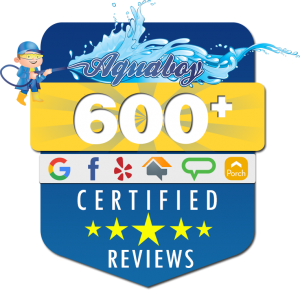 Once your Aqua Boy project is complete, we’ll thoroughly review the results with you. If there are even the slightest issues, we’ll address them immediately. 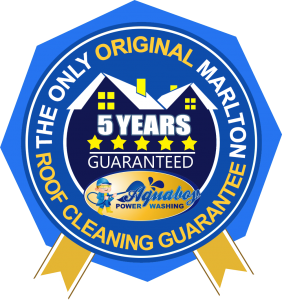 Furthermore, our 5 Year Roof Cleaning Warranty is the leading guarantee in Marlton, Cherry Hill, Medford and Moorestown. No other company can offer our peace of mind when it comes to this. Our reputation is the HIGHEST in South Jersey. Just take a look online and you can see who the leader is. It’s no surprise why we are the most trusted professional power washer around. Choosing the right power washing company can be be a difficult process, but it doesn’t have to be! 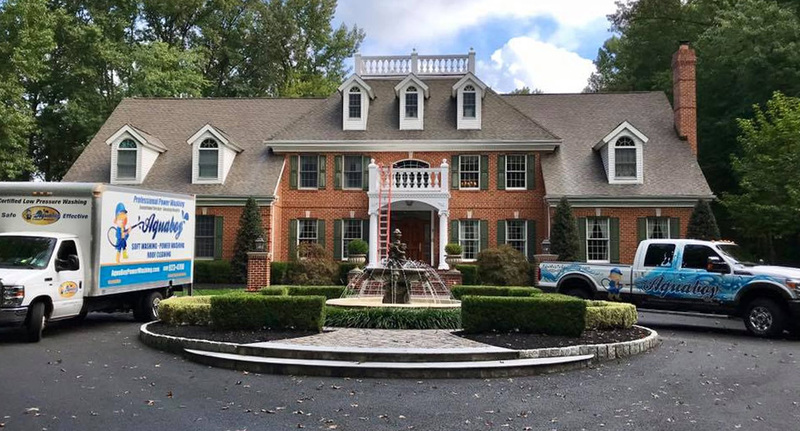 We are the most recommended and sought after soft wash roof cleaning in Marlton, Medford, Cherry Hill, Voorhees, Berlin, Moorestown and more! Trust the most awarded company to handle ALL of your cleaning needs. For your home and business alike, Aqua Boy has the best reputation. Ask your neighbors, chances are we’ve cleaned their roof too! We’ll take care of everything from start to finish with our Total Care© Cleaning. You’ll quickly realize why we’re the best in Marlton and South Jersey!